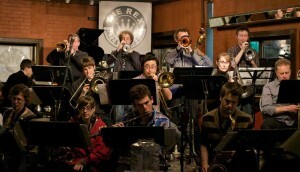 The Danjam Orchestra is a New York based contemporary jazz large ensemble that performs the music of Daniel Jamieson. This orchestra’s acclaimed 2011 debut release, SUDDEN APPEARANCE, placed Jamieson at the forefront of the current crop of young big band leaders. Produced by esteemed pianist/composer/educator Jim McNeely and featuring the great John Riley on drums, the disc highlights Jamieson’s wide-ranging compositions and well-honed arranging skills, which in the hands of his handpicked jazz orchestra swing, inspire, and challenge listeners with a program of emotional depth and stylistic diversity. Jamieson’s largest influences come from legendary Canadian composer and arranger Rob McConnell, and contemporary jazz guru Dave Liebman. Jamieson’s highly acclaimed Danjam Orchestra performs regularly in the New York and Toronto area. Click here for past Danjam Orchestra news!